+ Having all of this week off! 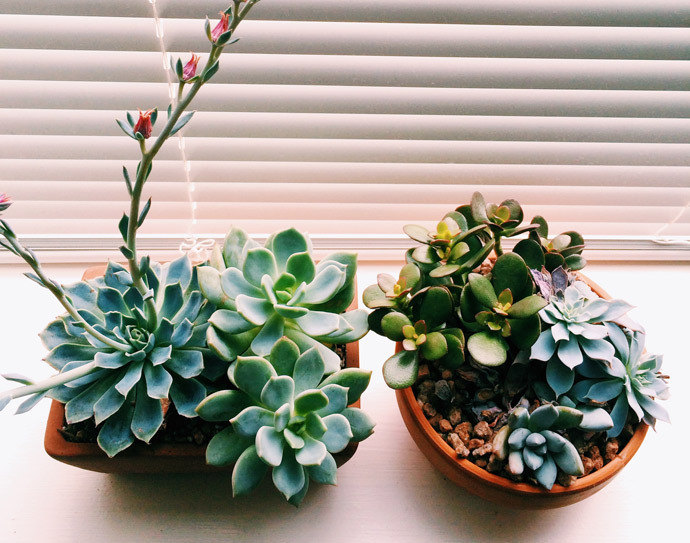 + My little succulents doing so well in the spot by the window! + Visiting Dai at work at the Fitbit office! I'm quite sad that my week off is coming to an end... I'm really not looking forward to going back to work next week! It has been so wonderful doing whatever I want or need to do each day without having to adhere to a particular schedule. Sigh. But, it will be okay and hopefully I won't let it put me in too much of a funk! Summer has gone by so quickly and I can already feel it rushing to an end. I have great things to look forward to, though, so I know that things will be good even though they will be different! Well, I must be going now! I have to go finish painting my bedroom so that we can start moving in my furniture this weekend! Woohoo! Last night we went to Ikea and I got a new bed and dresser, so I'm pretty excited :) Tomorrow I'm also having a swimming date with Leah, which I am really looking forward to also! It will be nice to spend some time in the sun with a great friend! What's on your happy list? How do you feel about summer ending soon? What are your weekend plans?